This cosy traditional cottage is now available to let for self catering holidays. 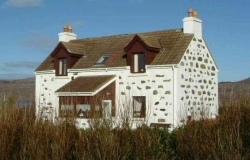 Situated close to the shore, it enjoys views over the Sound of Eriskay to nearby South Uist. The cottage can sleep up to eight in two double bedrooms (one of which has an en-suite shower room), and two smaller bedrooms which both have bunk beds.